We thank Ken Scott, of Trinity Translational Medicine Institute, for donating an original Liam Jones painting to Target Lung Cancer appeal. The painting is also newly framed.You can purchase tickets, at the cost of €10 each. There is a limit of 500 tickets. The draw takes place on 20 December 2017. This is a great opportunity to win a wonderful original painting and support this cause. 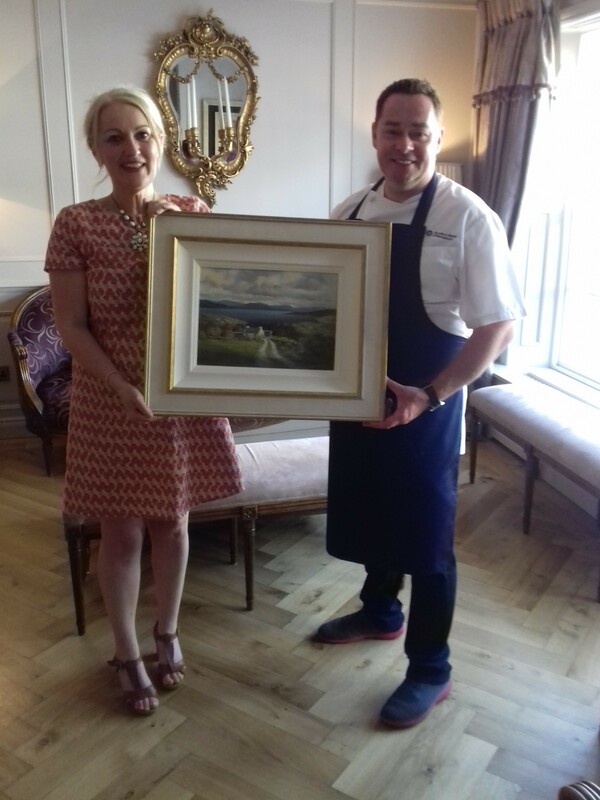 We were delighted to have Neven Maguire, our Target Lung Cancer ambassador, launch this raffle at his award winning, MacNean Restaurant at Blacklion, Co. Cavan. Liam Jones was born in Ballina, Co.Mayo. He held his first one-man exhibition in Dublin over 30 years ago – giving up a career with An Garda Síochána to pursue his passion for art. The wild beauty of the surrounding countryside was a powerful catalyst in moving him into the world of Landscape painting. He is widely travelled having worked in Europe and America, but is continually drawn back to this country and to the West of Ireland in particular. Since then he has been recording, in a personal way, the ever-changing moods and light of the West. Of his work, Liam says “no Poet, no Painter can ever fully capture all that is contained in the landscape. In fleeting moments when our pride takes a grip we feel we have it we’ve got it, but then the landscape merely changes and invites us further in”. “Aerach” is a word that could describe his work. There is a wonderful sense of space in these paintings, a tranquillity where nothing is hurried. He moves effortlessly from the small detail, to wide panoramas. The majority of his works reflect his motto, “Within the ordinary lies the extraordinary”. 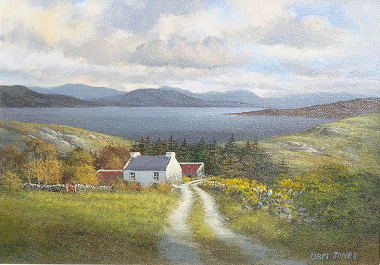 The painting in this raffle is an early work by Liam and could easily be described as a painting entitled “Coming home”. You can purchase tickets online, by clicking the button. You can buy as many tickets as you need, and we will let everyone know when the date for the raffle is set. The winner will be notified directly.